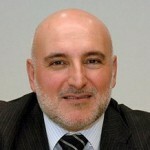 Enrico Scarrone joined in CSELT (now Telecom Italia LAB), the R&D division of the Telecom Italia Group in 1992. He contributed to several main research projects and subsequently to several standardization activities in ETSI, ITU-T, ATM Forum, 3GPP (SA, SA1, CT, RAN and RAN), 3G.IP, including chairmanships in 3GPP and ETSI) in the fields of ATM, signalling, mobile systems and their integration with IP. Participation and promotion of several early studies on integration of IP and mobile cellular networks has permitted to participate from the beginning to the work of 3G.IP, and indirectly to stimulate the work on release 2000 in 3GPP about the all-IP solution and the Multimedia Network principles. At the same time he was involved in in several Telecom Italia projects in technology planning and selection, including network budget forecasts, RFI, RFQ and testing, mainly in the mobile and fixed mobile convergence fields. This has allowed him to keep a strong link between real networks and standardization/research. This includes roll out of GPRS, EDGE, UMTS, HSDPA, EV-DO, Fixed broadband, FMC, IMS and other technologies in Austria, Spain, Greece, Turkey, Brasil, Peru’, Indonesia, and technical consulting in several other countries. He is participating to 3GPP SA1, dealing with service and operational requirements in 3GPP mobile systems, where served as Chairman from 1996 to end 2011. He was also deeply involved in the foundation of ETSI TC M2M (/where served as chairman from 2011 and 1012) and oneM2M, in charge of developing a global multiservice system for M2M communications and Internet of Things, He is also coordinator for M2M standardization in the Telecom Italia Technology and Operation department.